Patbingsu is a popular shaved ice dessert enjoyed by all ages especially during the hot and humid summer seasons in Korea. It originally began as ice shavings mixed in with sweetened azuki beans known as pat and it was usually sold by street vendors. Nowadays, patbingsu has become a very elaborate summer dessert, often topped with ice cream or frozen yogurt, sweetened condensed milk, fruit syrups, rice cake bits, chewy jelly bits, cereal flakes, and various fruits such as strawberries, kiwi fruit, and bananas. They are available in different flavors where green tea and coffee are some of the popular varieties found at cafés in New York, Los Angeles, or Atlanta. 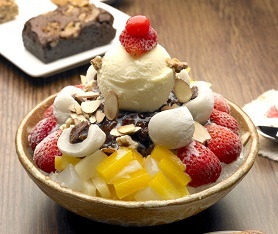 Additionally, due to its extreme popularity, patbingsu is even found on the menus of many Western-based fast food restaurants in Korea such as KFC, McDonald's, and Burger King during summer times. Starbucks Korea also released a frappuccino inspired by patbingsu.